The sharing song teaches kids to share things with their peers. 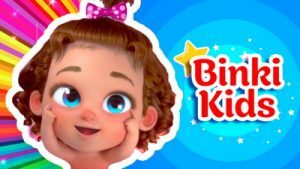 In this particular song, Baby Eva, the cute character from Binki Kids is the main protagonist. Of course, parents will choose to create their own version of the song by replacing the name. The tune of the song is the same with the more popular “Wheels on the Bus”, so both kids and parents will be familiar with it. All her toys with Peach. all day long, all day long!